I had a victorious moment on Sunday when I was finally able to get Mr. Veggie Girl into an Asian grocery store. I've been asking him for years to come grocery shopping with me at one and he's turned me down each time. You see, Mr. VG is a small town guy from Wisconsin (think 3,000 people small) so he's still adjusting to life in a vast, multi-national, multi-cultural metropolitan like Los Angeles. He can be a little narrow-minded in going to new places and eating new foods so every time I'm able to get him to try something new, something that's out of his comfort zone, I claim victory. And this past Sunday, victory was mine! I suppose he had no choice in the matter. We had driven all the way to the Port of Los Angeles in Long Beach for Navy Week hoping to tour the USS Abraham Lincoln (a super carrier) as it'll be the last day that it's docked there. Unfortunately, thousands of people were thinking the same and by the time we arrived at noon, they were no longer allowing people to queue for tours. Since we were already out in that area, I decided to stop by Marukai's 99 cents store in Gardena for a look-see. And since 99 Ranch was next to Marukai, I dragged Mr. VG there for some grocery shopping. Sneaky aren't I? As I had expected, Mr. VG wrinkled his nose when he entered the store. I don't know why but all the Asian grocery stores have a distinct, somewhat smelly odor, and I knew he would pick up on that right away. However, when we turned the corner and arrived at the seafood counter, his eyes widened with interest and he began acting like a kid in a candy store. Mr. VG is an adept huntsman and fisherman so all the live, fresh fish and seafood had definitely caught his attention. "Let's get some fish," he immediately said, "I'll fillet it." They had some huge, roughly 2 ft. long, 25 to 30 lb. salmon (for sale at $2.99 a lb.) which Mr. VG initially wanted to buy. Although it was a great price for fresh salmon, it was just way too big. I also envisioned my kitchen being splattered with fish guts and smelling like a stinky fishmonger's by the time Mr. VG's done hacking up such a large fish and thought to myself, no thanks! "Pick something else," I told him. After going up and down the seafood aisle a few more times and checking everything out, Mr. VG finally decided on some striped bass. He picked out two of them with a total cost of $14. At the checkout line, I turned to him and said, "Just to be sure, you're cooking them, right? You know I don't do fish, except for salmon fillets." "I know," he replied. "I'll cook it and it'll be a surprise." The recipe in this post is Mr. VG's. He made it up entirely and honestly, it was really good! The bass was so fresh and had no fishy flavor to it whatsoever. Mr. VG filleted the bass perfectly as I didn't get a single bone in my meal. Before I get to the recipe, here are some instructions from Mr. VG on how to fillet a fish. I apologize for the blurry pictures but Mr. VG was moving so quickly I could hardly keep up with the picture taking. I also don't have photos of the cooking process because he shooed me out of the kitchen right after he finished filleting the fish. 1. Prep your fish filleting area by placing newspaper under the cutting board to catch any blood or guts that might spill over. A fillet knife is recommended but if you don't have one, a knife that is sharp, thin and flexible will make do. 2. First thing to do is to find a soft, fleshy spot behind the fish's gill. Once you find it, hold the fish's head firmly and slice into this soft spot. 3. Cut straight down until the blade reaches the backbone. Don't cut through it. 4. Run your knife along the backbone with a cut about 1-inch deep into the flesh until you pass the dorsal fin. This is to create an open path for your knife to run along. 5. Holding the corner piece of loose meat firmly, slowly begin to slice deeper into the fish until the blade reaches the rib cage. Go slowly so you don't cut into the rib cage as this will keep the bones out of the filet. Cut along the rib cage with your blade running as closely to it as possible. Continue cutting along the rib cage until you reach the top of it. 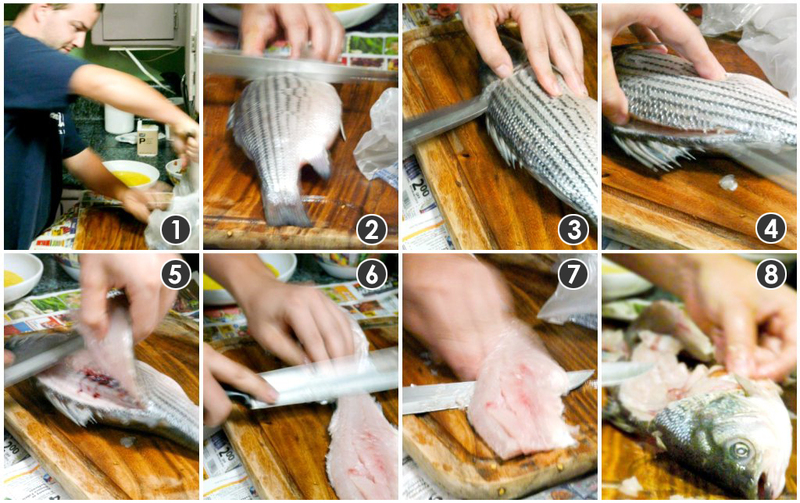 Push the knife through the width of the fish until the blade exits the other side. Slowly cut along the top of the rib cage until you reach about the end of the dorsal fin. Slightly angle the blade down and cut slowly until you reach the back bone. Flatten your blade back out and then begin cutting along the backbone until you reach roughly 1/4 inch from the tail fin. 6. Flip the piece of meat over so that the flesh is on the upside and the skin side is down. 7. To remove the skin from the fillet, hold the attached fillet firmly at the tail end. Insert the blade between the skin and flesh then use a slight pressure to make the blade bend slightly so that you are running the blade as closely to the skin as possible. Strip the skin off the meat completely. 8. Flip fish over and repeat with the other side. 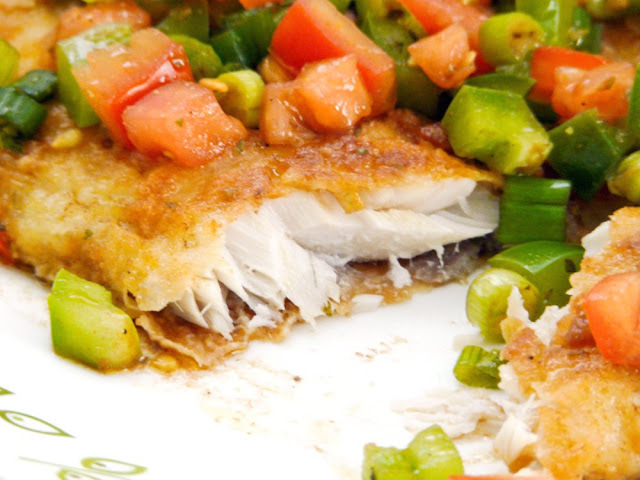 Tip: Be careful not to cut into the stomach of the fish as the acids might affect the flavor of the meat. Just cut over the stomach instead. If you have any questions about filleting fish, feel free to email Mr. VG at slinkywink (at) gmail.com. In a small mixing bowl, whisk the vinegar, salt, pepper, garlic powder and herbs together until well mixed. Drizzle the oil slowly into bowl until it is incorporated and the mixture is emulsified. 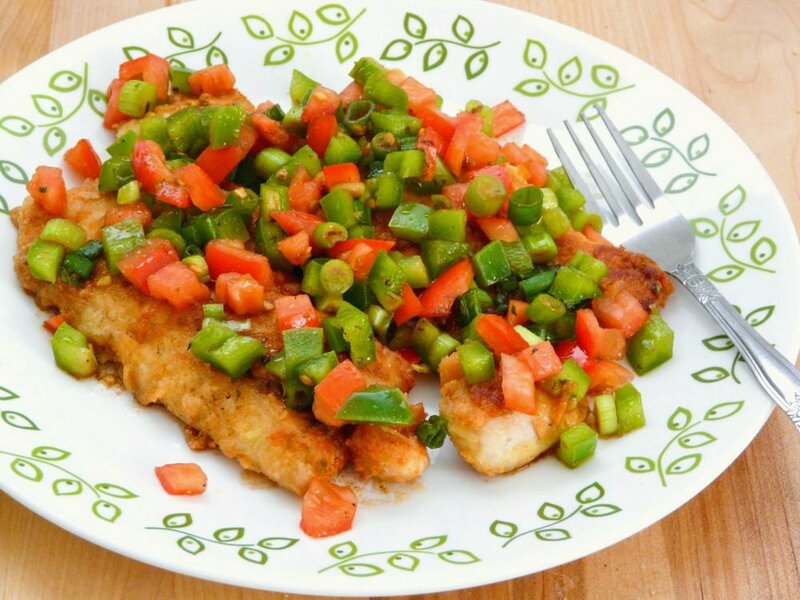 Add the diced tomato, diced bell pepper and green onion to the mixture. Set aside or chill in the fridge until ready to use. Season the flour with salt and pepper. Prepare two shallow pans and fill one with the beaten egg and the other with the seasoned flour. Pour the vegetable oil into a frying pan. The oil should be about 1/2" in depth. Over high heat, heat the oil until it starts to smoke. You can test the oil for proper temperature by dropping a pinch of flour into the pan. If it sizzles, it's ready. While the oil is heating, batter the fish. Dip the fillets into the egg mixture first then into the flour mixture. Coat it evenly with flour and shake off any excess flour. 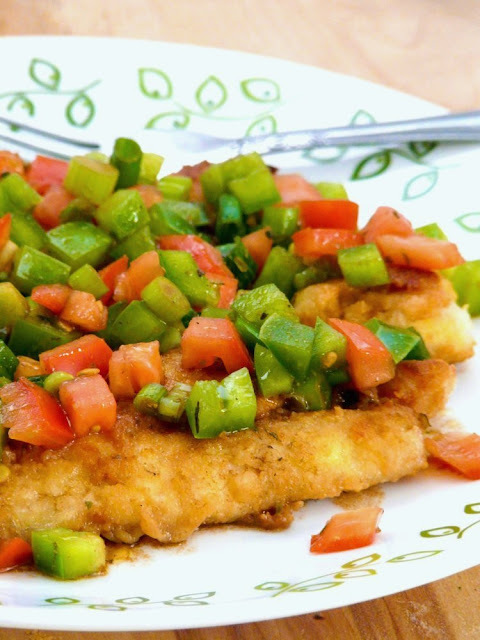 Gently slide the battered fish into the hot pan and fry until golden brown on both sides. Remove and drain on paper towels. Serve immediately and top with the relish.